A little over a year ago I saw that a new butcher had opened in town and was offering a special offer on meat hampers. With the cost of the hamper making us a big saving on what we would have spent at the supermarket we decided to go for it. Having purchased all our meat for the month in one go I separated the different sections into freezer tubs and brought out as necessary. It was something that we continued up until we moved house when we were too far to justify making a trip back to collect meat hampers. We hadn’t managed to find something local to us so had to resort back to purchasing from the supermarket. The cost is something that we have really noticed so when someone suggested LiveLean.co.uk for ordering meat hampers online. I was keen to see whether ordering online would save me money, be convenient and still have access to great quality meat. The best of British hamper arrived first thing in the morning in a large cardboard box, with a large foil jiffy bag inside with ice packs ensuring that the meat included arrived chilled. As I started to pull out the packets of meat from the packaging, it was a little like Mary Poppin’s bag in that it felt like I was never going to reach the bottom. As I laid all the meat on the kitchen table I looked at it and wondered how long it would take us to eat all that was included. Wanting to ensure that the meat was frozen at the best possible time I immediately set about portioning the different packs. To enable us to simply select a box or two from the freezer when required. As I packaged the different cuts within my freezer tubs I was amazed by the size and quality. The chicken breasts were twice the size of those we have bought from the supermarket and the steaks looked amazing – so good that they didn’t reach the freezer and were cooked for dinner that evening. Purchasing meat hampers online did feel a little strange, however, after seeing the range, size and quality of the meat we received it is something we will be repeating. The savings compared to a supermarket shop is amazing and the meat is so much bigger too! 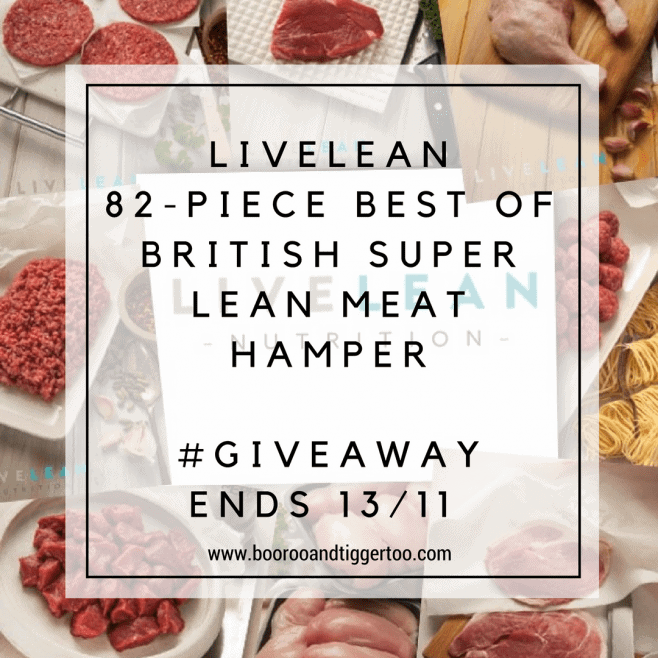 To help show you just how easy, convenient and tasty ordering from LiveLean.co.uk is, they have offered one lucky reader the chance to win an 82-Piece Best of British Super Lean Meat Hamper. Disclosure: We received an 82-Piece Best of British Super Lean Meat Hamper FOC for the purpose of review. Just started Slimming World and meat is free of Syns so this hamper would be ideal. Fantastic prize! Would need to look up some new recipes to do it all justice. Wow … get the family round and enjoy !!! !